Independence day is just a few days away so I spent a bit of time over the weekend digging into the data to see what are the most listened to songs on the Fourth of July. 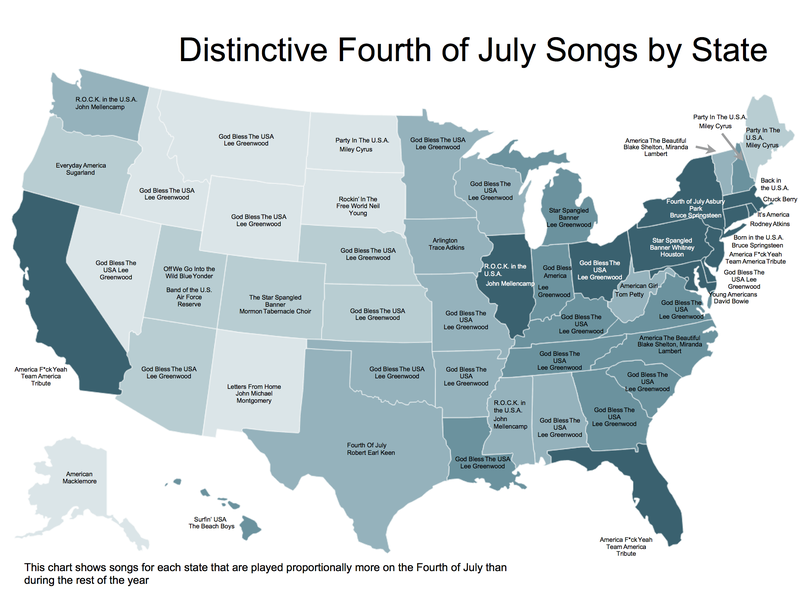 Eliot wrote a great piece about the data for the Spotify Blog: The Most Distinctive Fourth of July Songs in the 50 U.S. States. Here I dig in a bit deeper. From a musical perspective, The Fourth of July is a very interesting holiday. It’s a big summer outdoor party – and the music reflects that. On the Fourth, people listen to patriotic songs, BBQ songs, popular songs, party songs, songs about place and history. People listen to wide range of genres, from rock and pop to folk, country, marches, and new weird america. To see what music people listen to on the Fourth I went through about 5,000 playlists that people have created that have ‘fourth of july’ in the title. I aggregated the songs across all of these playlists and created a playlist of the top 100 or songs. I think it is a pretty good list of the music that we listen to more on the Fourth of July than on any other day. There’s a John Philip Sousa march, Woody Guthrie’s This Land is Your Land, Katy Perry’s Firework, lots and lots of country music. Some artists appear more frequently than others – Bruce Springsteen, John Mellencamp and Lee Greenwood are Fourth of July favorites. This is a much more listenable playlist. However, I think the data mined playlists do provide an excellent starting point – a big pool of Fourth of July songs. With a genre and popularity filter these could be turned into decent, listenable playlists. Similarly, give this pool of Fourth of July songs to a team of music curators and they can build some pretty fantastic Fourth of July playlists for every type of music fan. This entry was posted on July 2, 2014, 7:29 am and is filed under code, data, playlist, Spotify. You can follow any responses to this entry through RSS 2.0. Both comments and pings are currently closed. You raise a good point about the playlist of most distinctive songs. I wonder if there’s a way to find a playlist which has the largest number of these distinctive songs. Cool stuff. Good call spelling out the “most distinctiveness” more explicitly this time–don’t want a repeat of the distinctiveness vs. popularity confusion from your last state map! Cool but I would definitely forego the Lenny Kravitz version of “American Woman” for the Original version recorded by “The Guess Who” much earlier.